A USDA scientist teaches MANRRS students about tomato grafting at the High School Symposium. Recently, the National Society of Minorities in Agriculture, Natural Resources, and Related Sciences (MANRRS) hosted its 31st National Career Fair and Training Conference. MANRRS is a non-profit organization that promotes academic and professional advancement by empowering minorities in agriculture, natural resources, and related sciences, and has more than 1,650 members in 38 states. Welcoming people of all racial and ethnic backgrounds, MANRRS works to increase diversity of talent in the field of agriculture. As a longstanding partner with this organization, USDA helped sponsor the 2016 MANRRS conference, where over 950 participants from across the Nation gathered to discuss ways to grow the next generation of leaders. Participants ranging from high school students to professional members explored the latest developments in the agriculture, natural resources, and related sciences along with professional development, networking, and mentoring. USDA is committed to developing and supporting the next generation of food, agriculture and natural resource scientists. Dr. Sonny Ramaswamy, director of USDA’S National Institute of Food and Agriculture (NIFA), highlighted the importance of developing the talent to address the agricultural challenges ahead during his keynote address. Recognizing the diverse and talented individuals at the conference, agencies collected 288 job applications on-site for 65 different vacancies throughout USDA which included student internships and recent graduate positions. USDA staff also held ten workshops and provided on-site mentoring. During the conference, students were also able to have real-world demonstrations. 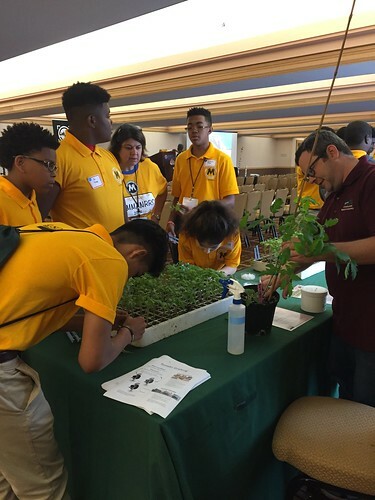 The Agricultural Research Service (ARS) organized a High School Symposium, introducing nearly 100 students to different agricultural scientific research areas through a hands-on session with scientists from USDA and other federal agencies. Students performed interactive experiments including mosquito control, DNA extraction and separation by gel electrophoresis, and tomato grafting to name a few. USDA salutes the work of MANRRS in mentoring and providing opportunities for the future generation of agricultural leaders. We look forward to continue partnering with this world class organization!